If you want to relax, get away from it all, have room to breathe and find some peace and calm, find solitude for painting or writing, a personal retreat can help you return home refreshed and replenished. Does something seem missing in your life? Are you at a crossroads and want to imagine the road less traveled, figure out what matters most and create a new vision for your life? A personal retreat can jump start you in the right direction. If you have made an intention to deepen your spiritual life with soul work and reconnect with the divine, a personal retreat provides a sacred space for transformation to occur. Whatever your goal, nourishing the body, mind and soul requires some alone time, some get-away time with yourself, with nature, with the divine presence. A glorious place in any season; the quiet is palpable and invites deep listening. Live as a hermit in the woods for a few days or a week (or more). Feel burdens fall away. Rest is possible. Receive support from the spiritual community. Meet kindred spirits. Join the daily meditations. Receive optional spiritual guidance from qualified directors. Eat nourishing food shared in the dining room. Balance solitude with time spent in a friendly community. Discover exciting new authors at our library and bookstore through an exceptional collection of books about creativity, spirituality, healing. 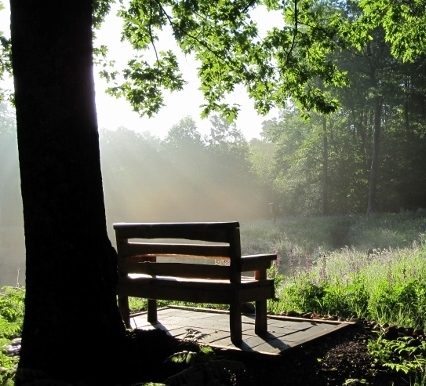 Enjoy meditation indoors or out: in the beauty of our chapel and meditation hall, or on our walking trails. Beautiful setting, comfortable accommodations, gracious staff. All of these contributed to a most restful, reflective, and replenishment of my soul, my energy, my love for our cosmos. My heartfelt thanks to you. Thank you for this wonderful place. It is a witness to the compassion our world needs. I needed the rest that I found there very badly. I am quite refreshed and grateful.